Set of nine models, showing the following stages. 1. Embryo 6 days old .2. 1st month of gestation. 3. Uterus with embryo in 3rd month of gestation.4. Uterus with fetus, in 4th month. 5. 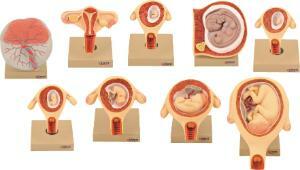 Uterus with fetus, placenta and umbilical cord.6. 5th month. 7. 7th month pregnancy.8. 8th month. 9. 9th month.